Prof IR Lim is currently a registered professional engineer (RPE). He received a first degree from Universiti Teknologi Malaysia, a Master's Degree and PhD from National University of Singapore and Nanyang Technological University, respectively. Prior to joining CityU, he was a post-doctoral research fellow at Department of Civil Engineering, The University of Queensland and Department of Mechanical Engineering, The University of Hong Kong. Prof. Lim is also a visiting professor at various universities including the University of Western Sydney, Dalian University of Technology, etc. He has expertise in vibration of plate and shell structures, dynamics of smart piezoelectric structures, nanomechanics and symplectic elasticity. 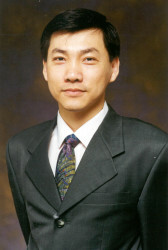 He is the Editor for Journal of Mechanics of Materials and Structures (JoMMS), Associate Editor (Asia-Pacific Region) for Journal of Vibration Engineering & Technologies (JVET), Associate Editor for International Journal of Bifurcation and Chaos (IJBC), International Subject Editor for Applied Mathematical Modelling (AMM), and also on the editorial board of some other international journals. He has published among one of the well-selling titles in Engineering Mechanics entitled "Symplectic Elasticity", co-authored with W.A. Yao and W.X. Zhong, as recorded in April 2010 by the publisher, World Scientific. He has published more than 300 international journal papers, accumulated more than 3000 independent citations, and one of the papers was granted the IJSS 2004-2008 most cited article award. He was also awarded Top Referees in 2009, Proceedings A, The Royal Society.